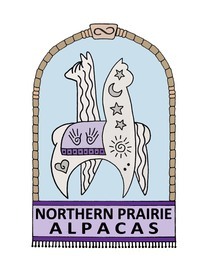 Snowmass Heart Song is sired by the the incredible Snowmass Sub-Zero and in addition to his wonderful dense/fine fleece he has a gentle personality which he has passed on to the crias born here at Northern Prairie Alpacas. 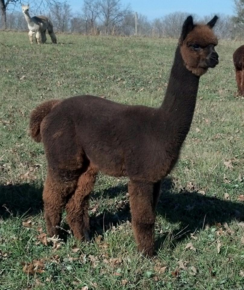 HeartSong is a gentle alpaca that adds value along with his consistent genetic power. Heart Song is holding incredible fineness with uniformity. Impressively low microns under 30 and Spin Factors (SF) under the AFD also mean great consistency in the fleece. Dr. Evan's skin biopsy showed strong gland presence which equates to density. His follicle density is 64.25 follicles/SQMM and an S/P of 12.5:1. He saw no primary fibers over 30 microns. Heart Song is in possession of many strong prepotent male genetic traits which would be expected to be passed to his offspring. 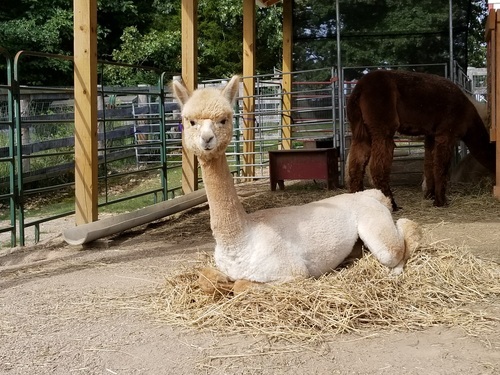 Bea is a beautiful female who has presence in the pasture. She is very calm and easy to handle both on and off lead. Bea has nice conformation along with a good bite. Bea has good fleece coverage from nose to toes and consistent crimp throughout. This stunning female has personality with a capital "P"; she is friendly, curious and very easy to handle. This black female has gorgeous fleece; very fine, buttery soft, shiny with a nice crimp and consistent throughout. Without a doubt Willow inherited the best traits from each of her parents; confidence, stature and pride from her dam and uniformity/fineness from her sire. 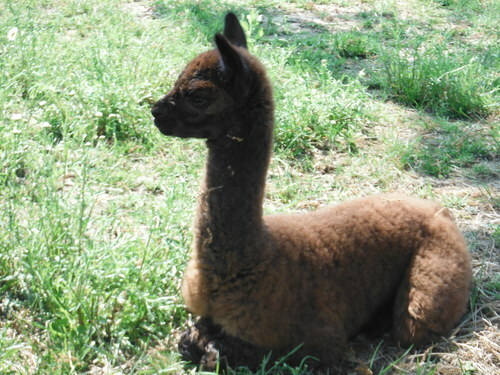 Willow's first cria is a gorgeous light fawn female with very fine, very organized, fleece. We are so happy with Willow's Hidden Treasure that we feel that breeding is definitely worth repeating.